"In a move that's obviously a shot across the bow of Hulu, YouTube has announced that visitors can now view 'thousands of television episodes and hundreds of movies' instantly through the site from partners like Crackle, CBS, MGM, Lionsgate, and Starz. 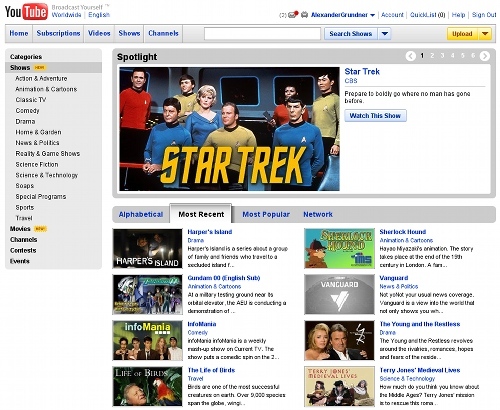 Visitors can access the TV show and movie content via the site's newly added Shows menu tab. In addition, YouTube members can subscribe to partner channels to be notified of any newly added content."